Happy Upcoming 2018 DISTRICT IV LMEA FESTIVAL WEEK, Directors and Choirs! BUSES will need to drop off on Convention Street IN FRONT OF CHURCH (avoid 6th Street due to construction next door) and head back around to park UNDER THE OVERPASS. Please keep your bus drivers cell number handy so that you can phone them when ready for pick-up. OTHER DRIVERS (parents, accompanists, etc) will need to park across the street in PAY parking lot on Convention (across from the construction area & next to First Presbyterian). The FBC parking lot is OFF LIMITS due to church daily functions/luncheons/bible studies throughout the festival days. *Security officers will be in the parking lot for directions. Directors, please keep your choirs outside the church door entrance until you have entered the building and registered your choir. You will receive a TIMER to help with movement to warm-up & concert. Choirs are encouraged to sit in the sanctuary to listen to other choirs HOWEVER, the director and parents should chaperone their choirs and NOT LEAVE THEM alone in the sanctuary. The sanctuary is not a HOLDING AREA. This year we are fortunate to have a program of all choirs, their 3 pieces and directors for your keeping. A big thanks to Eleanor Bach for making these available. Please make sure to announce YOUR choir after getting set up onstage. Please let Dana know if you will need extra music stands for musicians, etc. Also, we are working to make accommodations for any wheelchair needs. Please let Dana know if you need anything extra to make your assessment a success! Please submit your ORIGINAL COPIES (measures numbered for judges please!) to us upon arrival. These will be placed in adjudicator folders. Your music will be returned when you pick up your scores. ANY MUSIC OUT OF PRINT should have a letter from the publisher for copy permission to place in EACH judges folders. Please remind your choirs of proper ETIQUETTE while listening in the sanctuary or moving throughout the church. NO EATING and DRINKING allowed in the church sanctuary please. Thanks so much for reminding your students/parents. CHOIRS must stay together AT ALL TIMES. Please DO NOT allow your choir members to "roam" the church. Buddy system for bathroom is best. We must remember that other church activities will be going on as planned. We do not want to interfere with bible studies/luncheons/meetings for FBC. They are gracious to allow us the sanctuary, upstairs choral rehearsal room, Chapel, and Room 205 for sightreading. DROP BOX online for adjudicator results: look for a link from Katie Codina concerning the system for receiving your adjudications results. PROFESSIONAL recordings of your concert performance: These will be made available to you as in years past on CD's & given when you depart with scores. 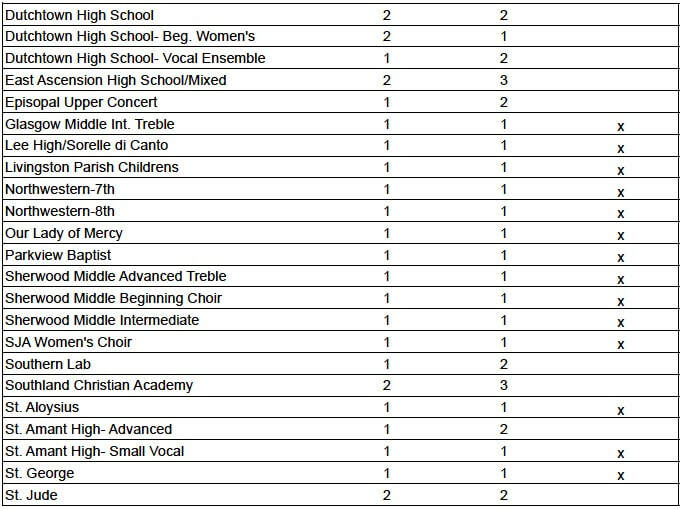 Please see attached (go over these with your choir members before the day of festival) An accompanist is provided in the sightreading room. If you want a nice picture of your choir, please make sure to bring your camera to take any photos after the concert performance. NO ONE IS ALLOWED in the balcony (due to judges area) please. A wonderful picture can be taken from the middle/back of church sanctuary. Please take this photo opportunity AFTER you sing. Will be available with your scores,  plaques and trophies in the room near the stairwell. Directors will sign for your awards and receive your scores. Sharing results/awards with choirs: Please remember when exiting the church with awards that choirs may wish to celebrate (and we celebrate with you!) 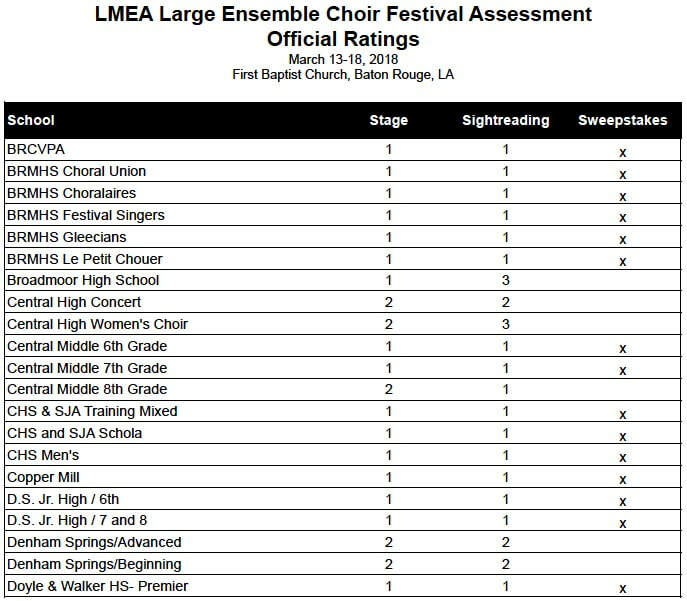 BUT remember that other choirs are singing for their assessment just a few feet away inside. Thank you. Directors: please be aware of your timers when you are in the warm-up rooms. Many want to have "just one more minute" and we need to STAY ON SCHEDULE. This year’s schedule allows directors a more “stress free” time in between choirs. Please do not ask if there might be another room to "hold" or "warm-up". TIMERS WILL BE LEFT IN WARM-UP ROOM and COLLECTED BY A RUNNER FOR OTHER CHOIRS DOWNSTAIRS. Please do not take them with you to the CONCERT or SIGHTREADING events. BLESSINGS on a WONDERFUL FESTIVAL!